The structural adjustment policies that were followed during the 1980s and 1990s have produced mixed outcomes, particularly in terms of poverty and inequality reductions. This has spurred, over the years, the international community to ask whether different combinations of public policies could have better development impacts. In particular, it is now often argued that infrastructure development can serve not only as an important source of fiscal stimulus in the short run, but also as a tool for encouraging growth in the longer run and an avenue for generating broad-based economic development. Such broad-based development is especially important since inclusiveness of growth features as an overriding objective of the current development paradigm. It is within that context that this book seeks to understand better the role of infrastructure in fostering and broadening development. This involves considering how infrastructure investment impacts aggregate production, sectoral allocation of production, economic growth, household welfare and poverty and inequality. An encompassing and original analytical approach is used that combines the strengths of general equilibrium analysis – which is essential for taking into account the economy-wide interactions across production and consumption activities that are spurred by infrastructure policies – and the strengths of micro economic analysis – which is needed to take into account the micro level effects of major economic policies, especially in terms of household behavior, household welfare, inequality and poverty. The book starts by presenting theoretical models of human capital and infrastructure development within an endogenous growth framework, followed by a review of some of the empirical findings on the effects of infrastructure and education on growth and poverty, with a particular emphasis on developing countries. Empirical evidence is then provided on the potential growth and welfare effects of increasing public investment in infrastructure in three Asian countries, the Philippines, China and Pakistan. To provide such evidence, an intertemporal dynamic computable general equilibrium model is combined with a microsimulation model and then applied to the three countries. The total capital stock is distinguished between public and private. Consistent with the reality of developing countries, in which most households do not have access to formal credit markets, credit-constrained and credit-unconstrained households and firms are also distinguished. Unconstrained agents are characterized by their ability to take decisions on savings and investment behavior that are based partly on their expectations of the future. This is an important feature of the book’s analytical framework: it recognizes that anticipations of the future (such as anticipations of the effects of infrastructure on future levels of development) can have an impact on current behavior and welfare. Although the exact infrastructure investment amounts are country-specific, the models and types of financing mechanisms considered are common to all three countries. The differences in the macro- and micro-economic outcomes are then essentially a matter of differences in the countries’ sectoral economic structure, in the distribution of assets and in production and consumption behavior. Aggregate and sectoral production outcomes, as well as poverty and distributive impacts, are analyzed in the short, medium and long runs. These impacts are contrasted across two alternative financing mechanisms, namely distortionary (i.e., through a production tax) and non-distortionary (through international borrowing) means of financing. The overall effects of an increase in public investments in infrastructure depend on a trade-off between the increased productivity generated by such investments and the distortionary effects of taxes. These effects also depend on the productive structure of the economy considered. The structure of the economy is also important when it comes to assessing the impact on household welfare: that impact is most dependent on the initial distribution of factor endowments (and thus on the distribution of income sources) and on household preferences. Comparisons across the three countries provide new and interesting insights. All of the evidence unambiguously suggests that increasing investment in public capital positively impacts economic growth through higher capital accumulation and greater productive capacity of private firms, both in the short and, especially, long runs. An important finding is therefore that public infrastructure investment promotes stronger growth and that the positive supply-side effects on private sector productivity increase over time. Because of this, the growth effect of public capital investment is larger in the longer term. Initial crowding-out effects of a production tax on private sector investment are observed in all three economies, however investing in infrastructure offsets this effect over time by crowding in private investment. Public sector investment in infrastructure also generally increases aggregate household consumption, with the exception of the first-year impact in Pakistan in the specific case of financing through a production tax. The book’s results further suggest that infrastructure investment financed by international borrowing generates larger beneficial effects in Pakistan and in the Philippines, while production tax financing should be preferred in China. This result comes despite the fact that financing through international borrowing generates what is known as a Dutch disease effect of appreciation of the real exchange rate. While for Pakistan some symptoms of this disease are visible only soon after the implementation of the infrastructure policy, the Chinese and Philippine economies display signs over a longer time period. In all cases, the positive productivity effects of public capital are crucial in mitigating the Dutch disease effects on production and welfare. The initial level of economic and infrastructure development also matters considerably. Public infrastructure investment appears to be associated with stronger long-run output and a larger crowding-in effect on the private sector in more developed economies with greater levels of private capital. This is seen inter alia when the long-term results of China are compared to those of the Philippines, two countries in which the effects of a comparable increase in public investments were simulated. An important finding of this book’s case studies is that certain industries are more sensitive to infrastructure policy than others. This is valuable policy information: some sorts of sectoral performance are more likely than others to be enhanced through investment in infrastructure. The main reason for this is that the private sector productivity impact of public capital is generally not evenly distributed across industries. Efficiency would dictate that policy should favor public infrastructure investment that is complementary to the capital of those economic sectors whose marginal product is highest in the long run. The magnitude of the impact of public infrastructure can also differ according to the choice of financing mechanism. Public capital investment decisions should therefore take into account the type of financing mechanism associated with such decisions. The case of the Philippines is informative in this regard: investment financed through foreign borrowing produces an almost equal long-run output effect across sectors, whereas production-tax financing does not produce any effect on some sectors. Perhaps even more importantly, some sectors can gain significantly under foreign borrowing: a country can become a net exporter in such sectors, while remaining a net importer in those same sectors under a production tax. 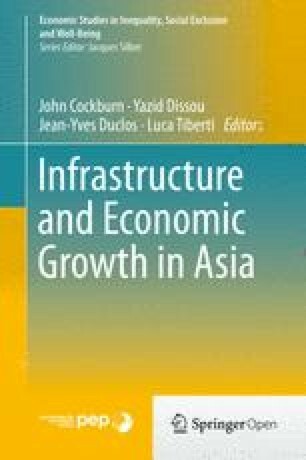 Infrastructure investment reduces poverty significantly in all three Asian countries considered in this book. Consistent with the macroeconomic effects, all three countries show a reduction in poverty over the medium to long run following an increase in public infrastructure investment. In the short run, that is 1 year after the implementation of the infrastructure increasing policy, the poverty results are ambiguous and depend on the type of financing scheme. Under a production tax, all countries exhibit an increase in poverty. In the Philippines, this is also true under foreign borrowing, mostly due to a significant increase in consumer prices. In general, the poverty effects are larger in the long run, in line with the increased aggregate economic activity over time. The contribution to poverty reduction made by different sectors and income sources naturally depends on the socio-economic structure of the economy being considered. This being said, it is through increased wages that infrastructure development impacts poverty most, followed by the increased self-employment revenues. Important differences are observed within each country, with rural areas generally contributing the most to the reduction of national poverty. Furthermore, both credit-constrained and credit-unconstrained households benefit from increases in public infrastructure spending, again with some differences across the countries. In the long-run, Pakistan and China see poverty fall more rapidly among credit-constrained households, while the reverse is true in the Philippines. Overall, inequality is only modestly affected by public infrastructure spending. The final lesson is twofold. First, the analysis of broad public infrastructure strategies does benefit from an analytical framework capable of modeling the economy-wide and the time-dependent effects of such strategies. Second, the distributive impact of infrastructure strategies is naturally context-dependent: it depends on the precise infrastructure investment mechanisms that are used by the states and on their interactions with the distribution of assets, the structure of household consumption and the structure of production behavior. Both of these features are important for understanding the dual impact of infrastructure investment through economy-wide and temporal effects on consumption, production and growth, and through micro-level impacts on welfare, poverty and inequality. It is our hope that this book will have demonstrated the applicability and the usefulness of such general equilibrium and microsimulation techniques for understanding the impact of public infrastructure investment policies.